The Intel Atom-driven, 27-inch Canvas tablet with pen, touch, and dial input support can be purchased starting at US$1,799, but depending on the hardware, software, and services chosen, it can get much more expensive. Back in January, Dell revealed the 27-inch Dell Canvas at this year's edition of the CES trade show. 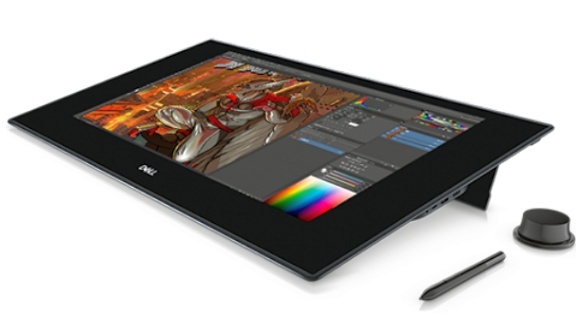 More than just a very large tablet, this is an accessory that has been designed to be used next to a PC to create graphics, edit videos, as well as to perform various other activities where using a pen, dial input, or a touchscreen would make things easier. The massive Dell Canvas 27 weighs about 18.5 pounds and measures 31.2X17.6X0.9 inches. Its 27-inch IPS touchscreen display has 2,560X1,440 pixels and supports 20-point multitouch input, being protected using Corning Gorilla Glass. The Canvas 27 comes with a pressure sensitive pen that magnetically sticks to the bezel when is not being used. The regular price of the Dell Canvas 27's basic configuration is US$2,570, but now it can be acquired for US$771 less. It comes with 3 years hardware service onsite included in the price, but those interested can purchase up to 5 years service, pro support, as well as accidental damage service.